EURGBP has been oscillating between a tight range of 0.8994 – 0.8282 levels, but the major trend remains puzzling even though bearish bias in the minor trend. Hence, 3-way options straddle seems to be the most suitable strategy for EURGBP contemplating some OTC sentiments and geopolitical aspects. The rationale: Well, let’s just quickly glance at OTC outlook before looking at the options strategies. Fresh positive bids in the shorter tenors have been observed to the broader bullish risk reversal outlook in the FX OTC markets, this is interpreted as the hedgers are still keen on bullish risks, while the pair displays 10% of IVs which is the highest among G10 FX space. 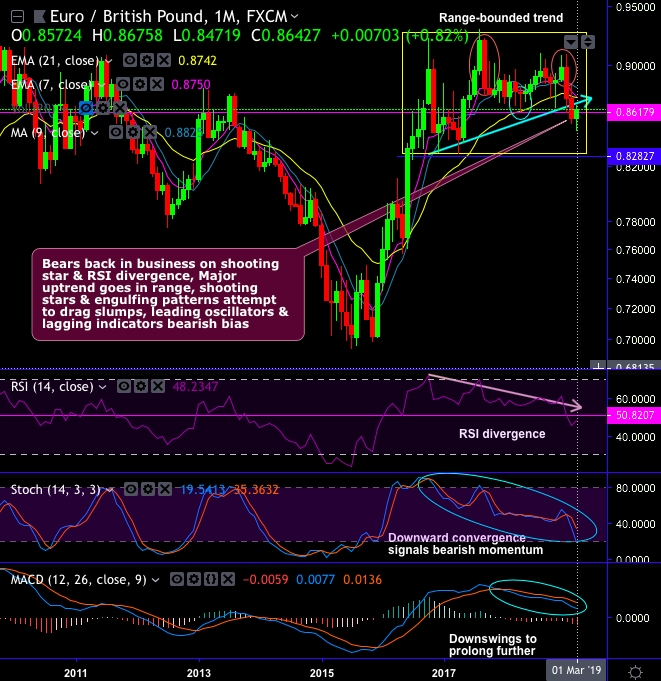 While positively skewed IVs of EURGBP has also been stretched out on OTM Calls. This is conducive for options holders of OTM call options. Sterling has been able to appreciate significantly as the Geopolitical surface considering the UK Parliamentary developments from the last week’s “meaningful” vote will continue to dominate the domestic focus. Until that emerges the risk of a no-deal Brexit remains in place, leaving the risk of Sterling setbacks high. 1) In case the House of Commons agrees to the exit deal this has to be ratified ahead of the EU elections. 2) In case the House of Commons decides against the exit deal Great Britain has to participate in the EU elections. 3) The date by which the exit agreement has to be ratified by will have to be well ahead of 23rd May (mid-April?) to allow sufficient time to organize the participation of the UK in the elections. Primarily, we see no reason on the UK or EU side why the extension of the deadline should not be accepted on this basis. That means the showdown for Sterling would not happen at the end of June but in a few weeks’ time – i.e. as soon as it is known whether the House of Commons agrees to the exit deal in the end or whether it doesn’t. And in fact, the pronounced difference between the 1 and 2 month GBP volatilities is consistent with this idea. You see any fresh negative bids in EURGBP risk reversals to the existing bullish setup, it should not be perceived as the bearish scenario changer. Instead, below options strategy could be deployed amid such topsy-turvy outlook. Options strategy: Keeping above seesaw geopolitical and hedging sentiments under consideration, 3-way straddles versus ITM calls are advocated, the strategy comprises of at the money +0.51 delta call and at the money -0.49 delta put options of 1m tenors, simultaneously, short ITM puts of 1w tenors. The strategy could be executed at net debit but with a reduced trading cost. Currency Strength Index: FxWirePro's hourly EUR spot index is inching towards 45 levels (which is bullish), while hourly GBP spot index was at -70 (bearish) while articulating (at 10:54 GMT).